Although Christmas break had officially started for the students of the University of Evansville, the Purple Aces continued to do what they did during the past semester: win basketball games. EVANSVILLE, INDIANA---Entering 20 points away from becoming the 32nd player from the state of Indiana (in Division I history) to net 2,000 points in his collegiate career, D.J. Balentine was determined to accomplish two objectives: Score at least 20 points and lead his team to their ninth victory of the season. He had no trouble achieving either. 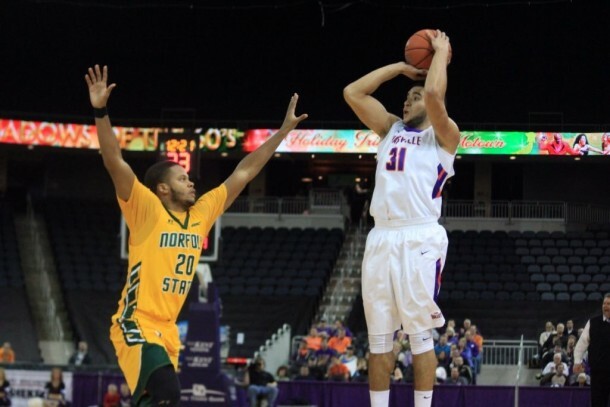 Although the Evansville Purple Aces trailed the Norfolk State Spartans at the half (37-36), Balentine and backcourt mate Jaylon Brown righted the ship in route to a 84-70 victory. Having great success with their 1-2-2 zone early, Norfolk State put their foot in the door by causing 4 turnovers in the first 8 minutes, which keep the score at 11-7. However, the Spartans eventually were able to kick down the Purple Aces' door with a 13-7 spurt, spurred by Preston Bungei, to steal a 20-18 advantage with 7:58 remaining in the first half. Later, Norfolk State decided to play "short" through VAVEL's 2015-2016 MEAC Preseason Player of the Year Jeff Short as he supplied 10 of his team-high 22 points in a five-minute stretch to extend their lead to a game-high six (37-31). Surprisingly, Evansville was flustered on their home-court! Though, two plays at the end of the half changed the context of the game and supplied momentum heading into the locker room. Down by the aforementioned deficit, the ensuing possession was crucial for Marty Simmons' team to add a basket and keep the game close. Fortunately, Egidijus Mockevicius not only put two on the board, but blew the roof off the entire arena. Mockevicius, the nation's second leading rebounder entering the night, was able to pull down a Mislav Brzoja lob, who corralled the ball during a front court scramble, and slam it through for a thunderous ally-oop. Following a missed layup by Norfolk State's Charles Oliver, the Purple Aces had a chance to pull within a single-possession before the first half horn. Even with the opposing defense playing fantastic, Jaylon Brown swished a long buzzer-beating triple in what looked to be a broken possession. 37-36 Norfolk State! Walking onto the hardwood from the intermission, D.J. Balentine was 8 points away from having 2,000 in his career. Scratch that! 2 points! Beginning the second twenty minutes like a firework, the "star senior" tickled the twine twice from outside in an immediate 12-2 run, which supplied Evansville with a 48-39 lead. Nevertheless the ground to make up, the Spartans were able to mount a second-half comeback, capped by a Jonathan Wade three-pointer, to lessen the distance to five (55-50, 10:07 left). Sadly for the road team, their morale booster was short-lived since Balentine was able to re-ignite the crowd with a pair of free throws. A pair free throws? You're kidding? These weren't just two made attempts at the charity stripe, they were the 1,999th and 2,000th points of his career. The crowd rose to their feet as the game continued to move along. Yet, they didn't sit down anytime soon as Brzoja swiftly nailed a three pointer to re-up the lead to 11 (61-50). The Purple Aces were in route to another victory. Thanks to his 26-point outing, D.J. Balentine eclipsed 2,000 points in front of the university's faithful. But will he surpass legend Colt Ryan's school record later in the season? Ryan, who possesses the sixth highest point total in Missouri Valley Conference history, ended his time in Southern Indiana with a total of 2,279 points. Therefore, with Balentine currently sitting at 2,002, he needs to average only 13.2 points per game for the remaining scheduled games this season in order to surpass the mark. 'Only?' Balentine entered this evening with a 21.6 points per game average! Barring injury, consider the record his. As in their previous six losses, the absence of RaShid Gaston, who transferred to Xavier, was felt this evening. Yes, Jeff Short is a tremendous talent, but he can only do so much. Even with 22 points (on 8 for 15 shooting) Thursday night versus a very good Evansville squad, the 6'4" senior received no help whatsoever from his fellow starters. Too harsh? No, not too harsh! Short outscored the rest of the Spartans' starting five (Jordan Butler, Zaynah Robinson, D'Shon Taylor, and Charles Oliver) 22-20. 22-20! A "Robin" to his "Batman" must emerge on Norfolk State, considering their suitcase will stay packed while road matchups at UTEP, Old Dominion, and Alabama surface as the next three. With Duane "Boo" Gibson at the end of the bench and "day-to-day" (knee injury), junior Jaylon Brown has made up for the absence of his fallen teammate very well (9.2 PPG coming in while Gibson is in street clothes). Tonight, he took it up a notch. Making his presence felt with a momentum swinging trey, Brown was instrumental in helping the Purple Aces keep their lead above double-figures as he produced 10 of his career-high 17 in the second half. Following tonight's contest Brown commented on what he saw offensively: "Just taking what the defense gave us throughout the night. I really wasn't looking for the drive as much--I took my chances when I saw it. I ran some offense and stuff like that. But, I saw things I knew I could make a play on and did it. That was really the main thing." "To be able to do it here (Ford Center) was an amazing feeling and I am very blessed to be able to do it." ---Evansville's D.J. Balentine on what it was like to accomplish his personal milestone at home. "That's a good question. We probably don't have anybody, we're just not a great one-on-one defensive team. We got to do better of getting support to those guys. That's what made it difficult with Norfolk (State) because four of those guys were--I think 38% percent or above three-point shooters. Really it is fundamentals. We got to be more sound with our close-outs. We got to be more in tuned to our game plans and individual characteristics." ---Evansville Purple Aces' head coach Marty Simmons on improvements needed to be made before taking on more great guards going forward. "(Marvelle) Harris is a load. They are a very talented team. We played them last year down in Naples (Gulf Coast Showcase). He has great size and great athleticism. And (Cezar) Guerrero wasn't with them last year and he is really good. (Paul) Watson, I think, was playing the four (power forward), now he is playing the three (small forward). They have great size, great length, great athleticism. But again, it certainly starts with Harris. But he is surrounded with some really good players. For us to have a chance to compete, we have to be very sound and solid as a team."